Less than a week ago, we polled our readers asking should search updates be named? Well, we have over a hundred responses now, so I thought I share them with you. Overall, 82% said we should name all or some of the updates. 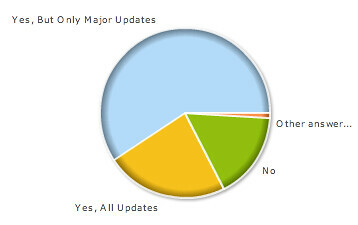 Only 17% said we should not name any of the updates. 59% said we should name only the important updates. Here is the break down of the results. Question: Should We Name Search Updates? Yes but just with normal update terms... 3.1 ... 4.5. otherwise it's confusing. Personally, I agree here with the majority. Previous story: Poll: Will You Remove The NoFollow Attributes From Your Pages?